Are you ready for Spring? 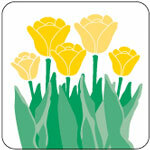 Tulips and daffodils will add color to your cup. These caps come 3 sheets of yellow, 2 sheets of Red and 2 sheets of Purple per pack. 250 caps per pack.